Where would you go if you wanted to meet a husky sledge dog, enjoy the snow and to make an outdoor adventure of it? Lapland, Siberia or North America? And where would your sense of adventure take you if you wanted to get away from it all, perhaps in a remote place in the Arctic wonderland? East Greenland is the answer – the area considered by many as one of the most isolated places in the world. It’s situated between the polar sea ice and the Greenlandic icecap and it’s so hardly accessible by sea that supply ships only make it here in the summer months. Fortunately for me there are frequent flights to Kulusuk from Reykjavik all year round, so I was able to access the region by plane in mid-April, which is a good time to go dog sledging. My dream of exploring this vast arctic landscape was certainly enhanced by a husky sledge safari. The Greenland husky is a unique breed of a husky dog, which is descended directly from the arctic wolf and its ancestry dates back some 12,000 years. Perhaps this is the reason why they don’t really make good pets as they prefer the outdoors rather than to be kept indoors. They have been used as a means of transport by Inuits since ancient times. To this day Inuits use these dogs for hunting and dog sledging is a vital way of travel in a country with no roads or roads covered in snow in winter. My sledge had 10 dogs pulling a wooden sleigh with 2 people in it (myself and the Inuit musher). 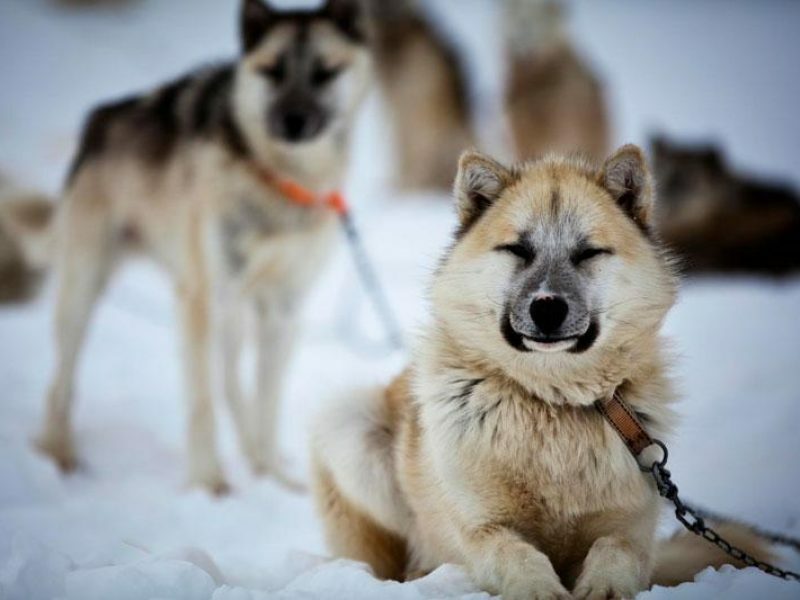 Unlike dog sledges in Northern Canada and Lapland, in Greenland dogs are lined up in pairs in a ‘fan’ formation and attached to the sledge individually to one harness pulling the sledge. Each dog has a different role within the team, with those the closest to the sledge being ‘wheels’ – they provide horse (or rather dog) power to the rest of the team; there are also lead dogs, swing dogs and point dogs with their individual roles in the team. Even though these dogs are known to be semi-wild, mine were in fact quite friendly and let me play with them and were happy to be petted and cuddled. Be wary however, as they are often bred and kept in packs, therefore it’s always best to approach them with caution. The dogs were anxious to get moving, howling and jumping around, as they just couldn’t wait to run. My guide gave a sign to embark and I sat down on the sledge covered with a reindeer skin for insulation. A few moments later off we went and soon we were sliding through the vast white wilderness of Kulusuk island. We followed a previously trodden trail towards the mountains, only to find ourselves way off the beaten track a few moments later, with dogs pulling through the freshly fallen snow making a new trail ourselves. What an experience it was! It will remain in my memory forever. Speeding through the truly amazing arctic landscape of a completely frozen fjord and surrounding snow covered mountains, it was incredibly quiet, except for the sound of the sleigh moving swiftly through the snow and the occasional command yelled to the dogs by the musher. ’How beautiful’ I exclaimed, to which my guide’s simple answer was: ‘Yes, it is’. Greenland is an incredibly beautiful and ‘raw’ land and everything seems to be truly ruled by nature in this remote and isolated region. Yet, with its frozen landscapes and one the friendliest indigenous peoples I have ever met, it makes a great destination for a romantic escape or a family vacation, and a husky sledging excursion is definitely the best way to explore it. It allows you experience a big part of the Inuit way of life yourself and is something I’d recommend to anyone who loves wide open spaces, snow and of course a man’s best friend! You can follow in Aggie’s footsteps on our Greenland Husky Adventure. For help with planning your Greenland adventure, send an enquiry or speak to Aggie direct.